Using the pole for fitness is the newest and most exciting way to get fit, change your body and have some fun. Pole fitness is enjoyed by people of all shapes, sizes and levels of skill. It gets real results quickly, helping you feel great, get strong and look fab. For something even more unusual, why not try your hand at aerial hoop? A circus-style fitness class, aerial hoop will leave you wondering why you haven't been hanging upside down sooner. 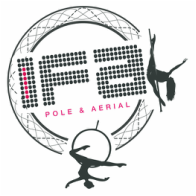 Take a look through the rest of the site to find out more about what pole fitness really involves and how IFA Pole & Aerial can help.